The one and only Ballet Is Fun TurnBoard® is the most popular training aid for dancers who want to improve their turning. Proper turning requires a straight back, focused spotting and correct arm placement. The Ballet Is Fun TurnBoard® helps young dancers practice all three of these elements without being on pointe. The TurnBoard® was designed to have very little friction, which allows dancers to focus on specific turning techniques. 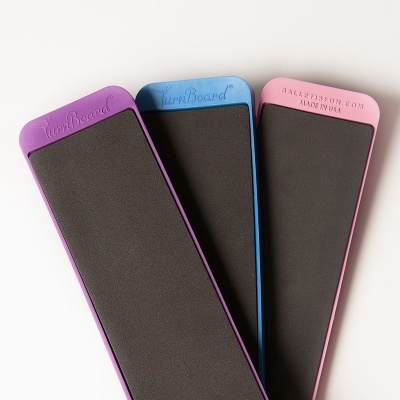 With practice, the TurnBoard® will help the dancer find their center, improve spotting, and increase confidence! The Ballet Is Fun TurnBoard® measures approximately 11 inches long and 3 inches wide. 1. What is on the bottom of the board? My husband is concerned that it will scratch our flooring (which is wood and tile). Would it spin on smooth concrete in a garage? The TurnBoard bottom is made of a hard plastic material that could possibly scratch a wood floor surface. We do have customers that use it on wood flooring but you'll just want to keep a close eye on how your particular floor holds up with it. Tile flooring and smooth concrete should definitely be OK.